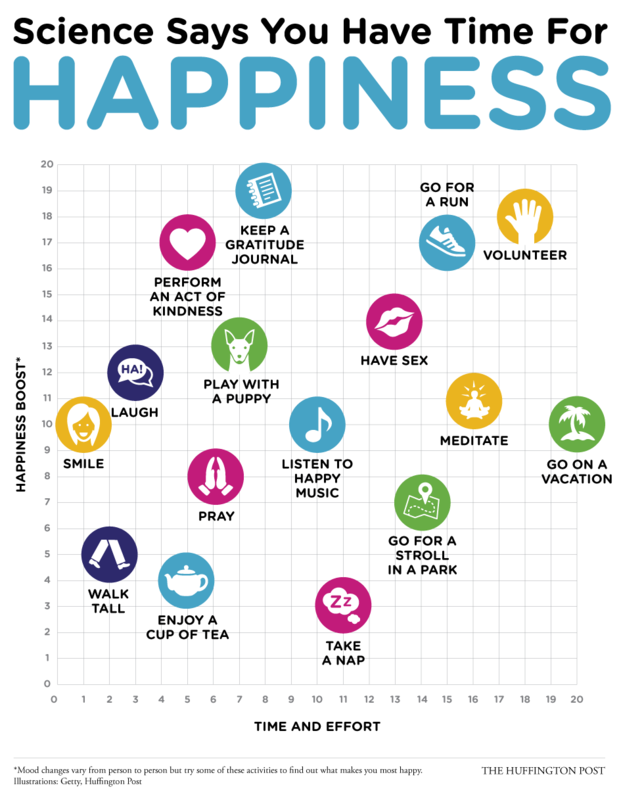 Whether you have five minutes to relax or a year to focus on building lasting habits, here are 16 scientifically-backed ways to boost your happiness levels. Meditate. Meditation may be helpful in lowering stress levels and reducing symptoms of mild depression, and has been linked with emotional well-being and improved sleep. Go on vacation. The mere anticipation of an upcoming trip can boost overall happiness for up to eight weeks before you take off, according to a 2010 Dutch study. Think of happy times. Feeling nostalgic about the past can make you feel happier and more optimistic about the future, according to a recent University of Southampton study.